Never too late to join in. I like the screenshot you currently have, very intrigued to find out with you what it will be in the end. So peaceful and relaxing. Great job. I would like to see some obstacles, for example a bird coming down and stealing a seed. 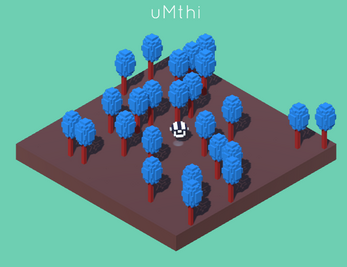 The trees move a bit as you bump against it, especially when the forest gets dense and you can't really see your character anymore, will make it visually appealing and easier to track your character. Thanks for a relaxing experience. Very nicely made, I second Luigi's point of rustling trees. Maybe also consider the seeds floating higher than the treeline at times? otherwise it gets a little blind when trying to find them. NIce artstyle fun little game aswell! It's a lovely little relaxing premise. The art style is beautiful, and the ambient sounds are really well done! I like the idea of a planting and growing game. The interaction however feels a bit directionless, picking up the seeds is a matter of clicking and waiting. So that waiting time might feel better if there was more to it - what if instead of tying the time to a space key, you tie it to the movement? As the player moves, the time moves, and trees grow, die, etc? The idea here is to give the players the feeling like they're affecting something with everything they're doing. It doesn't quite fit the theme, there remains only one possibility in the game - grow more trees. Perhaps there are more types of trees with more and more stuff you pick up? Giving the player the feeling like there's more to look forward to and surprise/interest them, or to make them feel more powerful/effective was the point of the theme, I think. 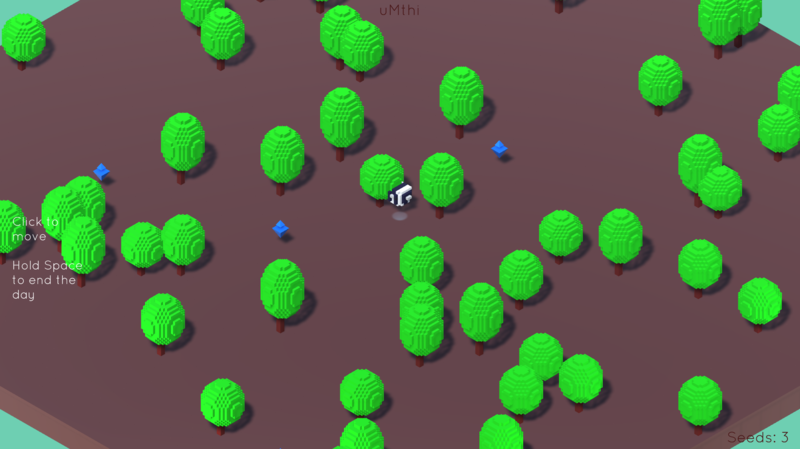 Persistence - It would feel really good if you could watch the trees grow bit by bit rather than just randomly regenerating the map each time. Great job on making this thing in a short period! - Very soothing experience - great colors and sounds! - Particle effects snap out of existence! Should stop the particles playing, then have a delayed destroy! This would match the soothing feeling I think! Thanks for all the kind words and detailed feedback everyone. @Desktoy woah thanks for the stress testing. I didn't think anyone would get to 100 seeds I think the lag is due to the fact that the map size grows each day and with the ground and trees all being individual meshes it becomes more and more costly to bake the navmesh. @riders_of_rohun Yeah I definitely wanted to have some kind of seasonal progression I think that'd be really satisfying. @Tuism I agree it doesn't really fit the theme that well I considered going for 72hrs and adding more mechanics as the game progresses but I felt it would end up being quite haphazard and take away from the experience. Personally I really like the waiting I didn't want the player to feel like they had to do anything or that something bad would happen if they didn't do things correctly but I agree the interaction by itself is quite shallow at the moment. Yes watching the trees grow would be so nice. @Bensonance I really like limiting the movement and making small interesting choices like this. 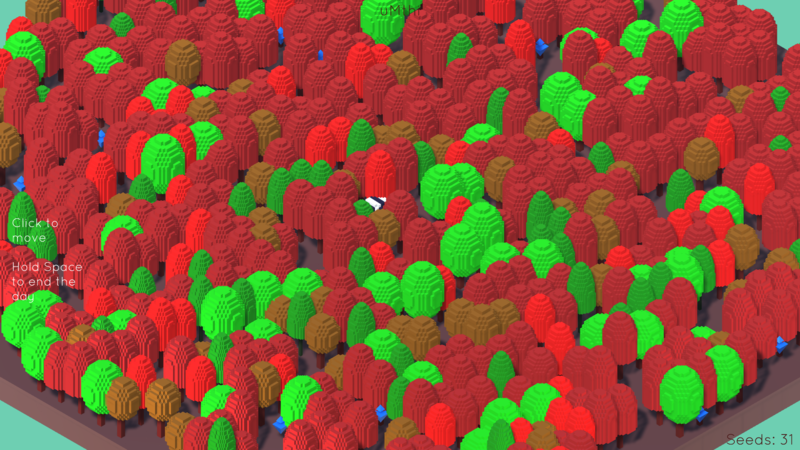 I wanted to have different colour seeds appear that meant you could unlock different coloured trees but they would be inaccessible at first and then later on you'd gain the ability to cut trees down that are in your way. I think some sort of progression is needed though while still maintaining the simplicity of the experience. Thanks again for all the feedback yall. This Game has a very nice art style, and is very calming as well. The path finding feature is a nice touch. For my view on bettering the game, perhaps give the player an incentive to get all the seeds in a day. And the ding sound gets a bit repetitive, so varying the ding sound would be good too. Such a relaxing experience. Everything looks so pretty. Great work man! Could be cool to implement some sort of limit on how much time I have to collect seeds or something along those lines to add a level of challenge but it's also fun to watch the scenery gradually expand and just kind of walk around. I really enjoyed this, it was super relaxing and the art style is beautiful. I think some very relaxed background music would be nice, but that's something that often takes a lot of time. It would be nice to be able to better tell where the seeds are, but I suppose part of the challenge is running around looking for them. Keyboard movement might also have been nice, but the mouse-based movement might translate better to a touch device. I have never been relaxed in my when I played this game. I am sure everyone must have said that is amazing, I am saying it again...I love the art! I would like to suggest if you can rotate the world 360 on the y-axis. Just to have a different point of view of where the seeds are. I really enjoyed the calming feeling the game creates, along with the subtle ambiance. The way that the character navigates the navmesh is real cute sometimes and I like the smoothness. Agreeing with the previous comment for the camera rotation, I think that'll add a lot to the game. You really nailed the calming/soothing experience. There's lovely ambiance and travelling around is very smooth. I would have loved more types of seeds to play to achieve different effects. Like building up something of an ecosystem. Like finding an egg and it making a humming bird, or planting a flower that the humming bird pollinates. That kind of thing.